Top 3 chocolaty products with a spicy kick — and they're organic and fair trade certified, too! January 16, 2009, 8:47 p.m.
Just a few years ago, fair trade chocolate was pretty hard to come by, except ordered in bulk online. Now, every roundup of yummiest chocolates seems to feature at least a couple organic and fair trade chocolates! So with Valentine’s Day creeping up on us, I thought I’d share my top three favorite hot and spicy fair trade chocolate products. Read, eat, and enjoy! 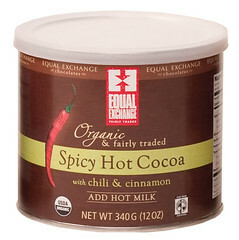 Equal Exchange’s Spicy Hot Cocoa. We’ve got a heat wave in California, but I hear it’s still winter in most other states. This fair trade and organic hot cocoa’s got a kick of chili and cinnamon to keep you warm and toasty. I like to mix it in with my organic soy milk. Get it at Equal Exchange for $7.75 a 12-oz can. Theo Chocolate’s Coconut Curry Milk Chocolate bar. Who knew chocolate tasted even better with a kick of curry? I discovered these spicy bars at the Eco Gift Festival in Santa Monica a year ago, and have been addicted since. Each gourmet bar costs $3.25; you can get them online at Theo or at Whole Foods and specialty shops. Larabar Cocoa Môlé. Great thing about Larabars: You always know exactly what you’re getting. In the Cocoa Môlé bar’s case, that’s just six simple, healthy ingredients: fair trade cocoa powder, dates, walnuts, chili, and cinnamon — all organic! The spicy-sweet combo boasts 5 grams of fiber and counts as a serving of fruit to boot — so you don’t have to feel guilty about your chocoholic habits. Find them at Whole Foods, REI, and other stores near you for about $1.75 each. Know of spicy fair trade chocolate products I’ve missed? Share in the comments area.